Nevertheless, a few are to be feared; and foremost among these is the Malmignatte, the terror of the Corsican peasantry. I have seen her settle in the furrows, lay out her web and rush boldly at insects larger than herself; I have admired her garb of black velvet speckled with carmine-red; above all, I have heard most disquieting stories told about her. Around Ajaccio and Bonifacio, her bite is reputed very dangerous, sometimes mortal. The countryman declares this for a fact and the doctor does not always dare deny it. In the neighbourhood of Pujaud, not far from Avignon, the harvesters speak with dread of Theridion lugubre (1), first observed by Leon Dufour in the Catalonian mountains; according to them, her bite would lead to serious accidents. The Italians have bestowed a bad reputation on the Tarantula, who produces convulsions and frenzied dances in the person stung by her. To cope with ‚tarantism,‘ the name given to the disease that follows on the bite of the Italian Spider, you must have recourse to music, the only efficacious remedy, so they tell us. Special tunes have been noted, those quickest to afford relief. There is medical choreography, medical music. And have we not the tarentella, a lively and nimble dance, bequeathed to us perhaps by the healing art of the Calabrian peasant? ‚Lycosa tarantula by preference inhabits open places, dry, arid, uncultivated places, exposed to the sun. She lives generally—at least when full-grown—in underground passages, regular burrows, which she digs for herself. These burrows are cylindrical; they are often an inch in diameter and run into the ground to a depth of more than a foot; but they are not perpendicular. The inhabitant of this gut proves that she is at the same time a skilful hunter and an able engineer. It was a question for her not only of constructing a deep retreat that could hide her from the pursuit of her foes: she also had to set up her observatory whence to watch for her prey and dart out upon it. The Tarantula provides for every contingency: the underground passage, in fact, begins by being vertical, but, at four or five inches from the surface, it bends at an obtuse angle, forms a horizontal turning and then becomes perpendicular once more. It is at the elbow of this tunnel that the Tarantula posts herself as a vigilant sentry and does not for a moment lose sight of the door of her dwelling; it was there that, at the period when I was hunting her, I used to see those eyes gleaming like diamonds, bright as a cat‘s eyes in the dark. ‚The outer orifice of the Tarantula‘s burrow is usually surmounted by a shaft constructed throughout by herself. It is a genuine work of architecture, standing as much as an inch above the ground and sometimes two inches in diameter, so that it is wider than the burrow itself. This last circumstance, which seems to have been calculated by the industrious Spider, lends itself admirably to the necessary extension of the legs at the moment when the prey is to be seized. The shaft is composed mainly of bits of dry wood joined by a little clay and so artistically laid, one above the other, that they form the scaffolding of a straight column, the inside of which is a hollow cylinder. The solidity of this tubular building, of this outwork, is ensured above all by the fact that it is lined, upholstered within, with a texture woven by the Lycosa's (3) spinnerets and continued throughout the interior of the burrow. It is easy to imagine how useful this cleverly-manufactured lining must be for preventing landslip or warping, for maintaining cleanliness and for helping her claws to scale the fortress. ‚I hinted that this outwork of the burrow was not there invariably; as a matter of fact, I have often come across Tarantulas‘ holes without a trace of it, perhaps because it had been accidentally destroyed by the weather, or because the Lycosa may not always light upon the proper building-materials, or, lastly, because architectural talent is possibly declared only in individuals that have reached the final stage, the period of perfection of their physical and intellectual development. ‚One thing is certain, that I have had numerous opportunities of seeing these shafts, these out-works of the Tarantula‘s abode; they remind me, on a larger scale, of the tubes of certain Caddis-worms. The Arachnid had more than one object in view in constructing them: she shelters her retreat from the floods; she protects it from the fall of foreign bodies which, swept by the wind, might end by obstructing it; lastly, she uses it as a snare by offering the Flies and other insects whereon she feeds a projecting point to settle on. Who shall tell us all the wiles employed by this clever and daring huntress? ‚Let us now say something about my rather diverting Tarantula-hunts. The best season for them is the months of May and June. The first time that I lighted on this Spider‘s burrows and discovered that they were inhabited by seeing her come to a point on the first floor of her dwelling—the elbow which I have mentioned—I thought that I must attack her by main force and pursue her relentlessly in order to capture her; I spent whole hours in opening up the trench with a knife a foot long by two inches wide, without meeting the Tarantula. I renewed the operation in other burrows, always with the same want of success; I really wanted a pickaxe to achieve my object, but I was too far from any kind of house. I was obliged to change my plan of attack and I resorted to craft. Necessity, they say, is the mother of invention. ‚It occurred to me to take a stalk, topped with its spikelet, by way of a bait, and to rub and move it gently at the orifice of the burrow. I soon saw that the Lycosa‘s attention and desires were roused. Attracted by the bait, she came with measured steps towards the spikelet. I withdrew it in good time a little outside the hole, so as not to leave the animal time for reflexion; and the Spider suddenly, with a rush, darted out of her dwelling, of which I hastened to close the entrance. The Tarantula, bewildered by her unaccustomed liberty, was very awkward in evading my attempts at capture; and I compelled her to enter a paper bag, which I closed without delay. ‚Sometimes, suspecting the trap, or perhaps less pressed by hunger, she would remain coy and motionless, at a slight distance from the threshold, which she did not think it opportune to cross. Her patience outlasted mine. In that case, I employed the following tactics: after making sure of the Lycosa‘s position and the direction of the tunnel, I drove a knife into it on the slant, so as to take the animal in the rear and cut off its retreat by stopping up the burrow. I seldom failed in my attempt, especially in soil that was not stony. In these critical circumstances, either the Tarantula took fright and deserted her lair for the open, or else she stubbornly remained with her back to the blade. I would then give a sudden jerk to the knife, which flung both the earth and the Lycosa to a distance, enabling me to capture her. By employing this hunting-method, I sometimes caught as many as fifteen Tarantulae within the space of an hour. ‚On the 28th of June, my Tarantula cast his skin. It was his last moult and did not perceptibly alter either the colour of his attire or the dimensions of his body. On the 14th of July, I had to leave Valencia; and I stayed away until the 23rd. During this time, the Tarantula fasted; I found him looking quite well on my return. On the 20th of August, I again left for a nine days‘ absence, which my prisoner bore without food and without detriment to his health. On the 1st of October, I once more deserted the Tarantula, leaving him without provisions. On the 21st, I was fifty miles from Valencia and, as I intended to remain there, I sent a servant to fetch him. I was sorry to learn that he was not found in the jar, and I never heard what became of him. The object of these hunting methods was not exactly to obtain Tarantulae; I had not the least wish to rear the Spider in a bottle. I was interested in a different matter. Here, thought I, is an ardent huntress, living solely by her trade. She does not prepare preserved foodstuffs for her offspring (6); she herself feeds on the prey which she catches. She is not a ‚paralyzer,‘ (7) who cleverly spares her quarry so as to leave it a glimmer of life and keep it fresh for weeks at a time; she is a killer, who makes a meal off her capture on the spot. With her, there is no methodical vivisection, which destroys movement without entirely destroying life, but absolute death, as sudden as possible, which protects the assailant from the counter-attacks of the assailed. Nevertheless, I had the courage to start afresh, this time on a Mole caught ravaging a bed of lettuces. There was a danger lest my captive, with his famished stomach, should leave things in doubt, if we had to keep him for a few days. He might die not of his wound, but of inanition, if I did not succeed in giving him suitable food, fairly plentiful and dispensed at fairly frequent intervals. In that case, I ran a risk of ascribing to the poison what might well be the result of starvation. I must therefore begin by finding out if it was possible for me to keep the Mole alive in captivity. The animal was put into a large receptacle from which it could not get out and fed on a varied diet of insects—Beetles, Grasshoppers, especially Cicadae (13)—which it crunched up with an excellent appetite. Twenty-four hours of this regimen convinced me that the Mole was making the best of the bill of fare and taking kindly to his captivity. To the philosophical entomologists I have something else to say: I have to call their attention to the consummate knowledge of the insect-killers, which vies with that of the paralyzers. I speak of insect-killers in the plural, for the Tarantula must share her deadly art with a host of other Spiders, especially with those who hunt without nets. These insect-killers, who live on their prey, strike the game dead instantaneously by stinging the nerve-centres of the neck; the paralyzers, on the other hand, who wish to keep the food fresh for their larvae, destroy the power of movement by stinging the game in the other nerve-centres. Both of them attack the nervous chain, but they select the point according to the object to be attained. If death be desired, sudden death, free from danger to the huntress, the insect is attacked in the neck; if mere paralysis be required, the neck is respected and the lower segments—sometimes one alone, sometimes three, sometimes all or nearly all, according to the special organization of the victim— receive the dagger-thrust. Even the paralyzers, at least some of them, are acquainted with the immense vital importance of the nerve-centres of the neck. We have seen the Hairy Ammophila munching the caterpillar's bra­in, the Languedocian Sphex munching the brain of the Ephippigera, with the object of inducing a passing torpor. But they simply squeeze the brain and do even this with a wise discretion; they are careful not to drive their sting into this fundamental centre of life; not one of them ever thinks of doing so, for the result would be a corpse which the larva would despise. The Spider, on the other hand, inserts her double dirk there and there alone; any elsewhere it would inflict a wound likely to increase resistance through irritation. She wants a venison for consumption without delay and brutally thrusts her fangs into the spot which the others so conscientiously respect. 1. A small or moderate-sized spider found among foliage. 2. Leon Dufour (1780–1865) was an army surgeon who served with distinction in several campaigns and subsequently practised as a doctor in the Landes. He attained great eminence as a naturalist. 3. 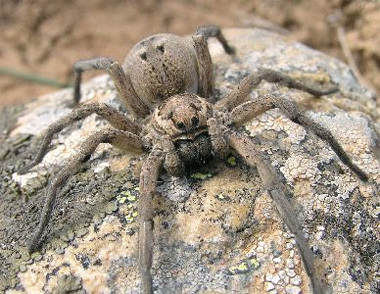 The Tarantula is a Lycosa, or Wolf-spider. Fabre's Tarantula, the Black-bellied Tarantula, is identical with the Narbonne Lycosa, under which name the description is continued in Chapters iii. to vi., all of which were written at a considerably later date than the present chapter. 4. Giorgio Baglivi (1669–1707), professor of anatomy and medicine at Rome. 5. Provencal for the bit of waste ground on which the author studies his insects in the natural state. 7. Like the Solitary Wasps. 8. Such as the Hairy Ammophila, the Cerceris and the Languedocian Sphex, Digger-wasps described in other of the author's essays. 9. The desnucador, the Argentine slaughterman whose methods of slaying cattle are detailed in the author's essay entitled, The Theory of Instinct. 10. A family of Grasshoppers. 11. A genus of Beetles. 12. A species of Digger-wasp. 13. The Cicada is the Cigale, an insect akin to the Grasshopper and found more particularly in the South of France.